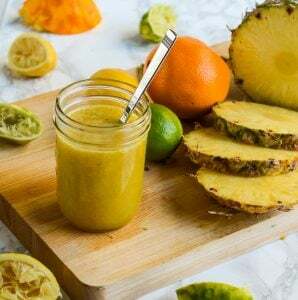 This super easy pineapple and citrus salmon marinade is a great way to give a fresh, tropical taste to your fish! Plus, the vibrant flavors make it a family favorite! Note: This post was updated with new content on January 7, 2019. I don’t know about you, but after the holidays I want food that is bright and fresh. This quick and easy salmon marinade is just that. Plus, it doesn’t have to be restricted to just salmon recipes. It is delicious on pretty much anything; pork, beef, chicken, veggies, you name it! Make a double batch and try it on everything! Since salmon (and really all seafood) is so delicate, I don’t recommend marinating overnight. It won’t become inedible if you do, but if you marinate the salmon for longer than one hour it changes the texture. Especially with this marinade recipe because it is so high in acid. As a rule of thumb, any time you are dealing with a high-acid marinade, you should cut the marinating time in half. My best results come from using the salmon marinade for fifteen minutes. You can bake the salmon skin side down in a 450°F oven for about 13-14 minutes or until the salmon is done. You can even make glazed salmon by mixing unused salmon marinade with a little brown sugar or honey (4:1 ratio). Brush it over the grilled fish before serving for a sweet, tropical flavor. Really, no matter what your favorite cooking method is, this salmon marinade is the best. If you want to make this salmon marinade like a sauce-boss, then here are some culinary proficiencies I recommend brushing up on. How To Marinate. This explains what is necessary for making your salmon tender as well flavorful. How To Buy & Store Citrus. I hate wasting money on produce that goes bad. Find out what to look for at the store and how to keep it fresh once it’s home. Basic Guide To Citrus Juicers. Get the most out of your citrus by finding the best juicer for you! How To Purée. 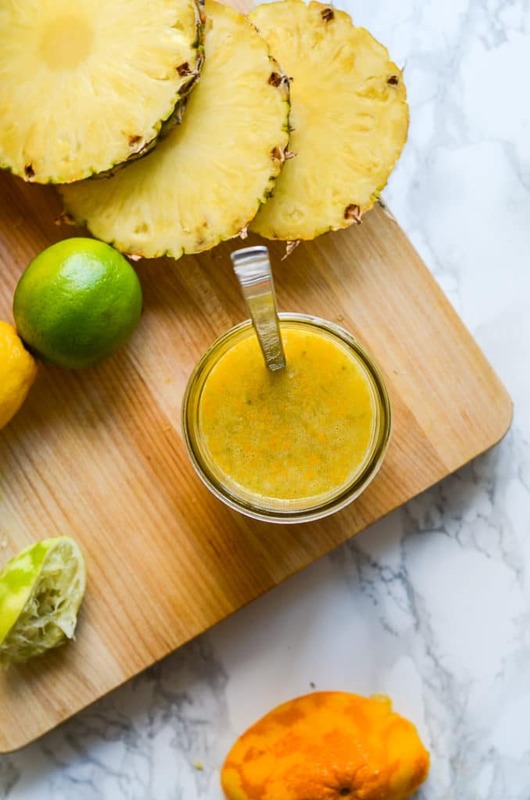 For using fresh pineapple in the marinade. One of the great things about this salmon marinade is that it stores really well. Whether you made more than you needed, or you want to prep-ahead for another day, this recipe is perfect for being kept at the ready. If you think you’ll use it quickly, it can last in the fridge for up to a week. If you think it will be a few weeks until you can use it, it will keep in the freezer for up to 6 months. Freezing liquids can be tricky, so I recommend putting a batch in a tightly sealed freezer bag then laying it flat to freeze. This will make multiple batches super easy to stack. Plus, it takes up less space in your freezer. Don’t forget to label it though! Once you are ready to use your salmon marinade, place the salmon in a plastic bag or small bowl and cover it with the marinade. If it is submerged, you don’t have to worry about flipping it. If you’re using a plastic bag, you’ll use less of the salmon marinade than a bowl. Just use enough to make a thin layer around the salmon. If you roll the bag down and clip it with a chip clip, it will keep the marinade from moving away from the salmon. 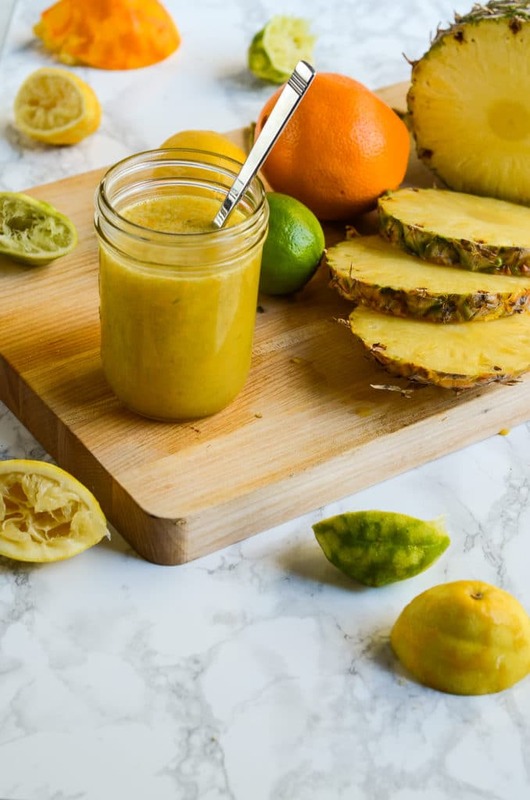 If you can, I highly recommend using fresh pineapple instead of juice for this recipe. All you need to do is purée the fruit in a blender or food processor before adding it. The fresh fruit will give a much brighter and fresher flavor than store-bought juice (especially if it’s frozen or concentrate). Want a free printable grocery list for this salmon marinade recipe? Get it HERE. The bright and fresh salmon marinade tastes like summertime at the beach! Combine the ingredients in a small bowl and whisk them together. Place the salmon inside of a plastic bag and pour enough of the salmon marinade on to submerge it. Remove the excess air from the bag and roll down the top and clip it to keep the marinade from moving around. Marinate for 15 minutes. Remove the salmon from the bag and cook your favorite way. Discard the used salmon marinade. If you're using this marinade on fish, only marinate the fish for up to 30 minutes or it may start to "cook" from the acid. Thank you Kristina! It’s such a good one to have around and whip out for any occasion! What a delicious marinade that’s quite versatile, too! Love the tropical touch from the pineapples! They really sweeten up the marinade and give it an extra boost of flavor, Abigail! This sounds amazing. I love anything sour and zingy so this sounds ideal for me. A pot in the fridge to chuck on anything and everything is my idea of heaven! Yaaasss!!!! I am so in the sour and zingy boat with you! Your marinade is a bright, sunny spot in our very cold winter! Can’t wait to try it with some chicken. Citrus makes an amazing marinade, so flavorful and it does a great job tenderizing the protein. I love all of the great resources too. Fantastic information! How bright and summery! I can’t wait til grilling season. I would use this on shrimp or chicken and I bet it would be fab. So good – especially grilled! It gets a really nice extra flavor from the natural sugars in the fruit! What a bright and lovely marinade with gorgeous flavors! What a great sauce! This would be good on almost anything. It really is! I haven’t found something that it isn’t good on yet! I bet all that zest gives this marinade tons of flavor – Saving this for grilling season next summer! It really does – and you’ll love it grilled. The natural sugars in the fruit give the food a nice extra boost of flavor when charred! I have a ton of citrus and am always looking for new ways to use it. This marinade looks delicious! I hope you get to try it Sharon! This is an excellent way to use up that citrus! nice article article thanks for sharing . It absolutely is! It’s a great pick-me-up on a dreary day. How beautifully sunny and bright!! Love your photos and I bet this marinade is delicious on fish. Can it be summer yet?! 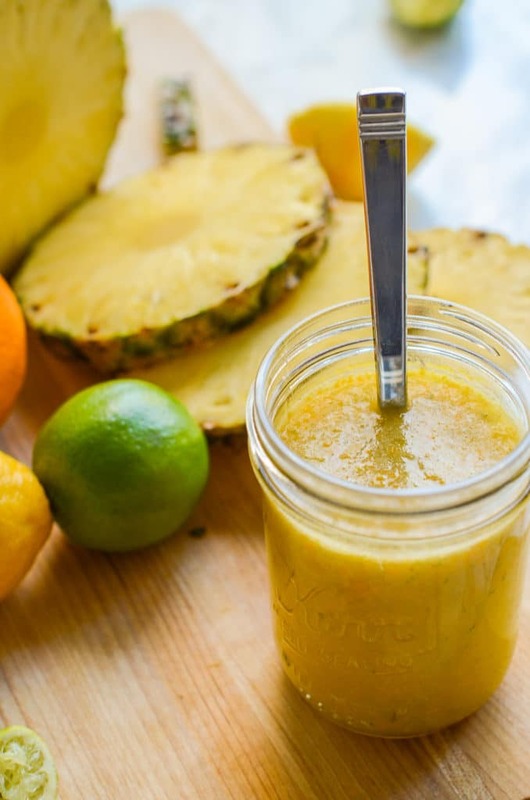 What a great marinade to help us use up all the citrus we have this time of year! Yes! And I love how fresh and bright it tastes on a dreary day! I usually have salmon once a week for dinner and I’m always looking to switch things up. I love the details in this post and how quick the recipe is. Can’t wait to try! I hope you love it, Lauren. I always keep extra around for quick meals and because it tastes good on everything! I’m always looking for new ways to prepare salmon since I like to make it often, so I’m loving this fun tropical marinade! Thank you, Sues! I love it, too. I always make an extra large batch and freeze it since it’s so good!